The Japanese Government on 22 December approved a record-high defense budget of 5.19 trillion yen (USD46 billion) to boost its missile ranges amid increasing threat from North Korea. The defence spending is a part of 97.71 trillion yen (USD862 billion) national budget plan for fiscal 2018. Prime Minister Shinzo Abe's government, which has strengthened Japan's defense capacities amid concerns over North Korea as well as China's maritime rise, has kept around 730 million yen aside in the budget to prepare for the introduction of the U.S.-developed land-based Aegis missile defense system. This will add to Japan's existing missile shield, involving Aegis destroyers, equipped with Standard Missile-3 interceptors and the Patriot Advanced Capability-3 interceptors deployed on the ground. Japan has also allocated about 44 billion yen for the purchase of upgraded missile interceptors with expanded range, altitude and accuracy. 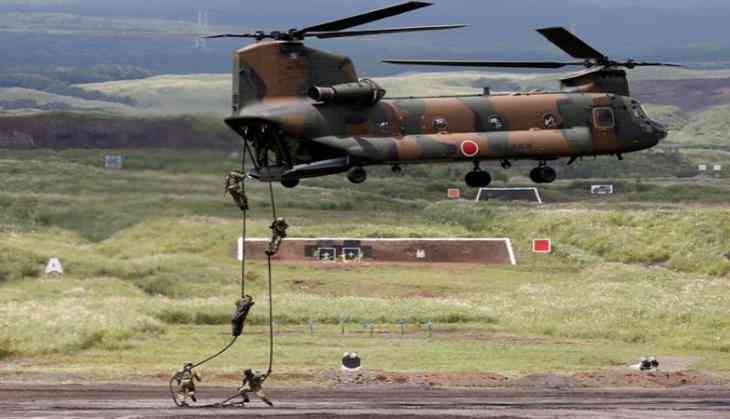 Some 4.7 billion yen was also secured to upgrade Japan's air defense command and control system to be better prepared for missiles launched simultaneously or on a highly lofted trajectory, a method North Korea has tested, Kyodo news agency reported. The government has allocated 62.2 billion yen as related costs in a supplementary budget for the current fiscal year to expedite the schedule for purchasing the new Aegis Ashore system and other projects linked to missile defense. There has been a rise of about two trillion yen for Japan's total outlays for ballistic missile defense on a contract base since the country first began building the system in fiscal 2004. The government will spend 78.5 billion yen to acquire six more F-35A stealth fighter jets and 39.3 billion yen for four more V-22 Ospreys. It also earmarked 30 million yen for research into introducing Lockheed Martin Corp.'s Joint Air-to-Surface Standoff Missile and Long Range Anti-Ship Missile, which both have a roughly 900-km range. Japan has also allocated 92.2 billion yen for building of two 3,900-ton destroyers of a new type, which can engage in diverse missions with a downsized vessel body and about 69.7 billion yen have been kept for the construction of a submarine. Rising tensions between the US and North Korea, which conducted its largest nuclear test in September and fired off a powerful ICBM in late November, have raised deep concern worldwide and Japan has been wary of this escalated issue as it hosts tens of thousands of American troops on its soil. The rise in defense budget is also being seen as Japan's response to China's increased military activity in regional waters.